Step 1 Pour the stock into a pan and add the chicken, ginger and garlic. Bring to the boil, then reduce the heat, partly cover and simmer for 20 mins, until the chicken is tender. Remove the chicken to a board and shred into bite-size pieces using a couple of forks. 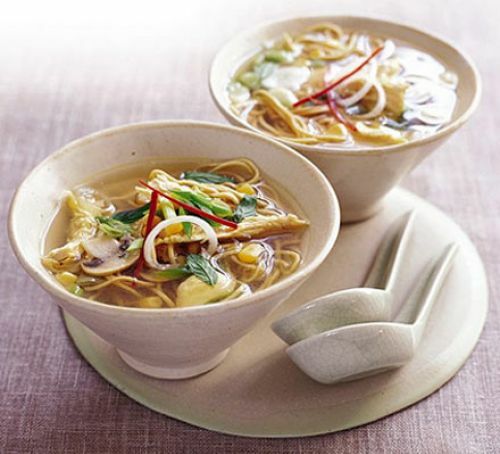 Step 2 Return the chicken to the stock with the noodles, corn, mushrooms, half the spring onions and the soy sauce. Simmer for 3-4 mins until the noodles are tender. Ladle into two bowls and scatter over the remaining spring onions, herbs and chilli shreds if using. Serve with extra soy sauce for sprinkling. Replace the chicken with 175g/6oz firm tofu cut into cubes, simmer for 5 mins, then add the other ingredients as before.